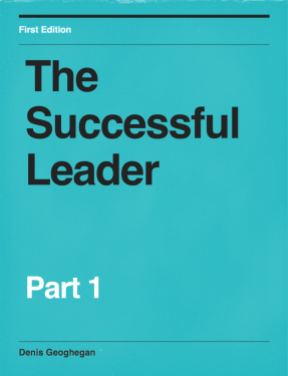 The process of goal setting based on outcome, performance and process goals comes from the world of athletics, but is equally applicable to business and personal development. Whether you are an athlete or the CEO of a business, this article will give you the tools you need to start planning like an athlete. In the 1960’s, two psychologists, Edwin Locke and Gary Latham, discovered that goal setting is one of the easiest ways to increase motivation and productivity. Over multiple studies Locke and Latham found that setting goals increase productivity by between 11% and 25%. The goal setting process forces us to take stock of where we are now. It is important that goals are set in a way such that we focus on the process and performance rather than the outcome of competition. There are three types of goals: outcome, performance and process goals. Goal setting is broken down in this way as it makes it easier to organise our thinking around how we’re going to achieve our goals. An outcome goal is the singular goal that you are working towards. Outcome goals are very often binary and involve winning, for example, wanting to win a gold medal or wanting to be the largest company in your sector. Whilst outcome goals are hugely motivating, they are not under your control as they are affected by how others perform. In a sporting sense this might mean that someone outperforms you on the field of play, and in a business sense this could happen if one of your key team members was ill or your competition outsmarted you. 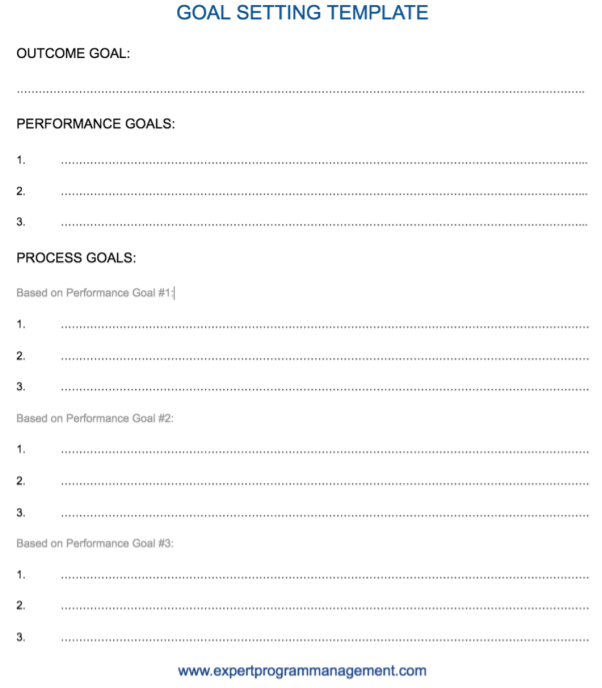 A performance goal is a performance standard that you are trying to achieve. These are the performance standards you set for yourself to achieve if you are going to build towards your outcome goal. run 5k in 20 minutes. run 5k in 18 minutes. It is this final performance goal achievement that makes them ready to attempt to hit their outcome goal of coming top 10 in a local race. By stacking performance goals in this manner they can be used to track performance towards your ultimate outcome goal – essentially acting as building blocks towards your outcome goal. Process goals support performance goals by giving you something to focus on as you work towards your performance goals. Process goals are completely under your control. They are the small things you should focus on or do to eventually achieve your performance goals. One of the big advantages of goal setting using outcome, performance and process goals is that it makes it possible to be satisfied with your performance even if the final outcome wasn’t what you wanted. This is why you often see post-race interviews with athletes where they say they’re happy or proud of what they achieved in the race even though they didn’t win. Specific: your goals need to be well defined. Measurable: it must be obvious when you have reached your goal. Agreed Upon: stakeholders need to agree the goals through negotiation. Realistic: all parties must believe the goals are achievable. Time-bound: the goals must have a deadline. Exciting: the goal must be exciting and give people energy to achieve it. Recordable: progress towards the goal must be recordable, for example, using KPIs. 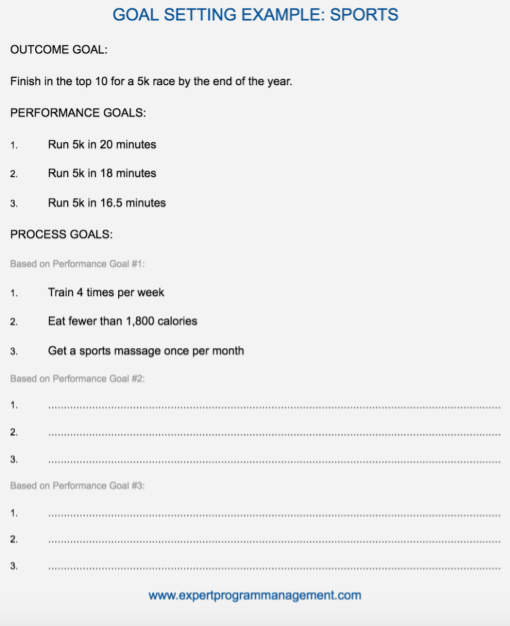 In this example the the performance goals are stacked, meaning that you need to run 5k in 20 minutes before you can start to work towards running 5k in 18 minutes. For this reason only one process goal has been completed, because we won’t commit to our process goals for achieving an 18 minute 5k until we have the first building block in place and are able to run a 20 minute 5k. Let’s look at a complete example from business to further build our understanding. Suppose our revenue is currently at $500k per month and we wanted to generate $1m revenue per month, then our goals might look like this. Sometimes we set goals such as to win a gold medal, or to generate more revenue than our competitors this month, however, the reality is that we don’t actually have control over these goals, our competitors could compete better and win. A shorter 13 week timescale will help keep you focused, committed, and excited about achieving your goal. Not too much will (hopefully) change in 13 weeks so you stand a good chance of hitting your goals which will help you to build and sustain momentum as you head into the next 13 week planning block. 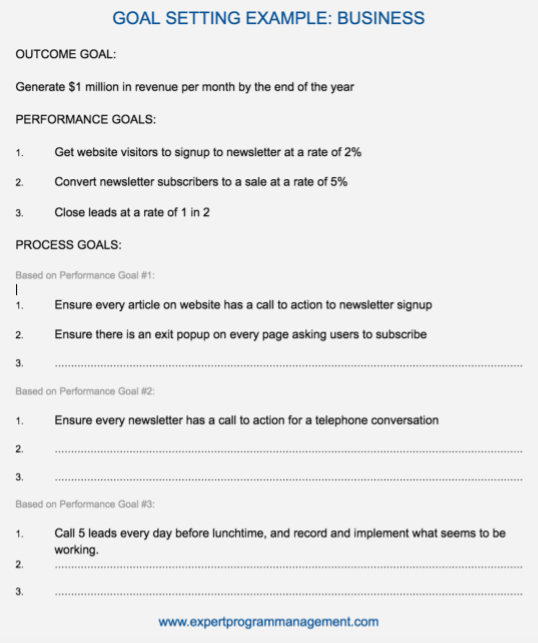 To make this super easy for you to use, we’ve giving you our Goal Setting Template for you to use to set your own outcome, performance and process goals.